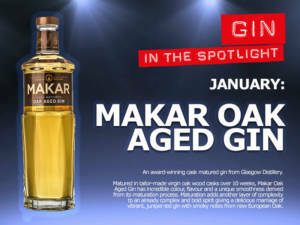 Makar Oak Aged Gin is an award-winning cask matured gin from Glasgow Distillery. Matured in tailor-made virgin oak wood casks over 10 weeks, Makar Oak Aged Gin has incredible colour, flavour and a unique smoothness derived from its maturation process. Maturation adds another layer of complexity to an already complex and bold spirit giving a delicious marriage of vibrant, juniper-led gin with smoky notes from new European Oak. NOSE: Soft on the nose, complex and lively on the tongue, with a peppery finish. WE SAY: Good enough to try neat over ice, and even better in a Gin Old Fashioned due to its smoky, vanilla and oak influence. Celebrate this Glaswegian triumph for Burns Night.